Mostly Board Games: Presenting.. Another Weekly Cap! Splendor: I've realized I don't actually play this enough. Its the perfect gateway engine building game and it scales well whether you have 2, 3 or 4 players. Why don't I play it more? I actually have no idea but had the chance to pull it out at two gaming nights this week both with 3 players and both nights with a new player. I only managed one victory on both nights as I often focus too much on building up the engine over getting victory points, but had a great time every game we played. No Thanks! : As someone else's pick, this came to the table again pretty quickly. Again I didn't mind it and was surprised that it actually played ok even with just three. Lucky for me I was able to dominate which might have been the reason I enjoyed it more than I should of that night. Again, its a decent filler worth checking out if you haven't tried it yet! Incan Gold: I keep introducing this game to new people and everyone keeps on enjoying it. Simple to explain, understand and play but the components are what people get most excited for! Everyone loves the little tent and stashing their well earned jewels inside out of the clutches of evil hazards and the peering eyes of other players. I seem to do well on this with no real strategy. I pretty much just stay and push my luck until I'm the last man standing - and then go for 1 or 2 extra treasures. I fail a lot but over the 5 rounds I somehow normally end up first or second. This came out on two separate game nights as well. Coup: My first sessions of this game weren't so well received. Must have been the wrong group because this week it was a hit. One quick game quickly leads to four and the more I understand it the more I enjoy it. It's still far more beneficial not to lie/bluff in this, but it's far more enjoyable when you do and successfully pull it off. I bluffed the captain about 4-5 times one game and didn't have him the whole time. Stole heaps and blocked a steal without being called out once. Jury is still out whether we'll play this regularly but my thoughts have grown far more positive than last time. Betrayal At House On The Hill: Ahh finally! I've been wanting to get this for a while and since I've had it I've been waiting for an opportunity to try it! Thank you my birthday for providing the perfect night and opportunity for me to pick the game. First thoughts - the first half of the game dragged a bit.. We kept stopping the haunt through good rolling and it seemed just to take ages! May have lost people's interest a little but when the Haunt finally happened it got the game going again. Of course I was lucky enough to have the haunt happen to me (totally was hoping it would the whole night!) and we quickly went into the Voodoo Doll scenario. Some of the rules we just kinda guessed and I made the mistake of not actually playing my character after the haunt started (just tracked the dolls etc and watched as everyone searched frantically), which cost me in the end as I could have been fighting people the whole time.. But I had fun and I think at least half the group did. I reckon if I can get it out for another play or two everyone will be loving it.. Cool game, neat concept, way too many small cardboard cut outs that are impossible to find and sort and a great haunted house theme that flows through everything. Can't wait for our next trek into the haunted house! Forbidden Desert: Now that Pandemic Legacy has been beaten, I kinda half thought of getting vanilla pandemic just to pull out on the odd occasion. As much as we enjoyed Legacy however, I think this group all needed a bit of a break as it was the only game we were playing for ages. Forbidden Desert from what I can tell plays very similar but has a completely different theme and a few cool features that set it apart from Pandemic. I went Desert over Island as it's meant to be a bit more complex with more depth. Dunno when it'll come on the table but when it does I think we'll like it. Lanterns: This is a strange one I guess. I've been looking at it a while as it gets a bit of fuss, is easy to find and is normally well priced. But something about it didn't excite me too much so I read a few online reviews and found myself swayed towards giving it a go. So here it is. I don't think It'll be in my favourites but looks to be one I should be able to get to the table often if I want it to be there. Last Will: I've wanted this for a while. Haven't played it, don't really know how the game plays but just like the concept of in a way trying to lose to win. You've received an inheritance and need to waste it away to be the winner. I'm imagining it'll be a bit light hearted and a bit strategic with a bit of a twist on it's theme. 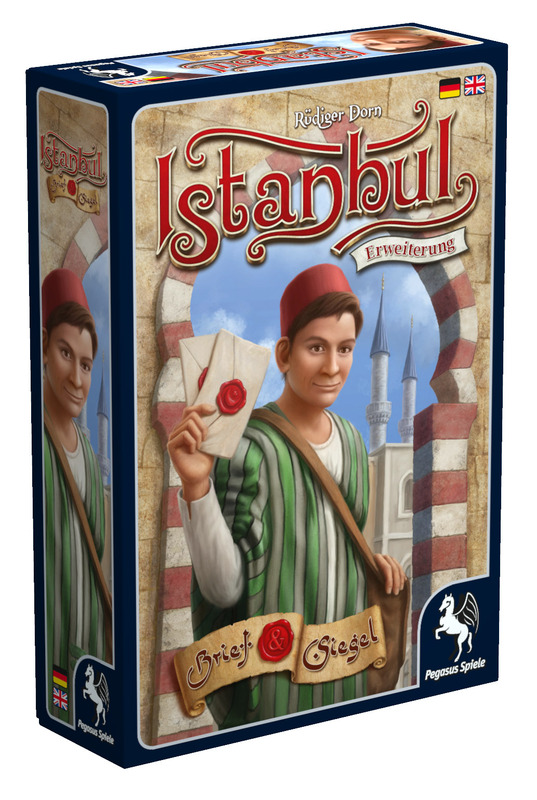 Istanbul - Brief & Siegel: I wasn't 100% confident I was reading the title of this expansion on the box properly so I had to look it up online just to be sure. I was reading right. No idea what it means, don't know what the expansion adds, I have no idea if its any good but I've been enjoying Istanbul enough to justify this to purchase it on a whim. Istanbul is reminding me a bit of 7 Wonders.. Not in gameplay at all but just expanding it into something huge that all blends nicely together with well thought out expansions. Need to get everyone familiar with vanilla before I get to add this in though so it could sit on the shelf a while.